Ever since Lauryn Hill was sentenced to prison for tax evasion, I’ve been hoping for her safe return home. While most made comments that condemned her for not paying what all of us – some who earn far less then her – must pay, I remained defensive. So what if she didn’t pay her taxes? Personally, I don’t care. Hell, if I could get away with it, I would too. 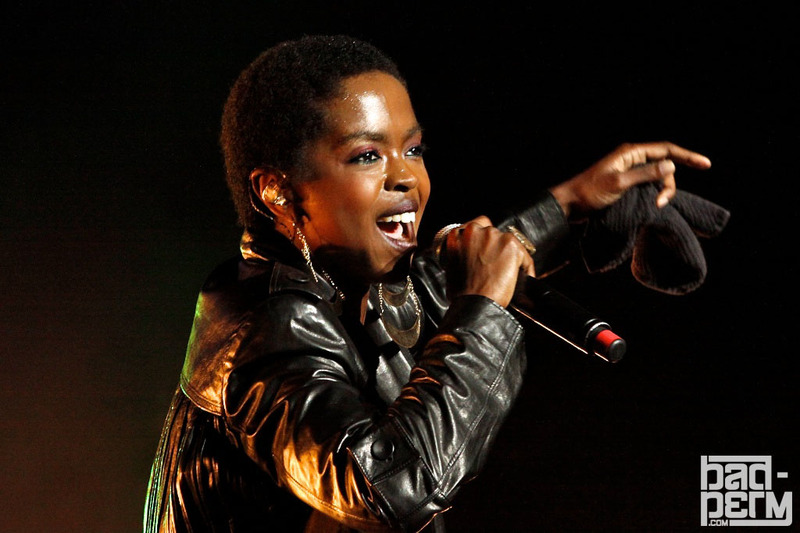 Lauryn’s always been my big-sister-in-my-head who resurrected me from teenage angst deeply seeded in gangsta rap and propelled me into a higher level of hip hop conscience that was female friendly if not mildly feminist. Needless to say, I have an emotional and artistic attachment to Lauryn and no, I did not believe that a mother, so supremely talented and monumental in our culture deserved to go to jail because she owed the government some money. It’s just money. After all, we allow child-killers to roam the streets freely and hold onto their weapons as long as their defence team is smarmy enough and their skin tone is largely absent of melanin – but I digress. Good news was delivered this past October 4 as Lauryn was release from a federal facility in Danbury, Conn., a few days shy of her original sentence based on good behaviour amongst other factors taken into consideration. She will remain on house arrest for the following three months which will include a year of parole, but that hasn’t stopped her from release the track Consumerism. What caught my eye today was the following image on Ms. Lauryn Hill’s Facebook page. 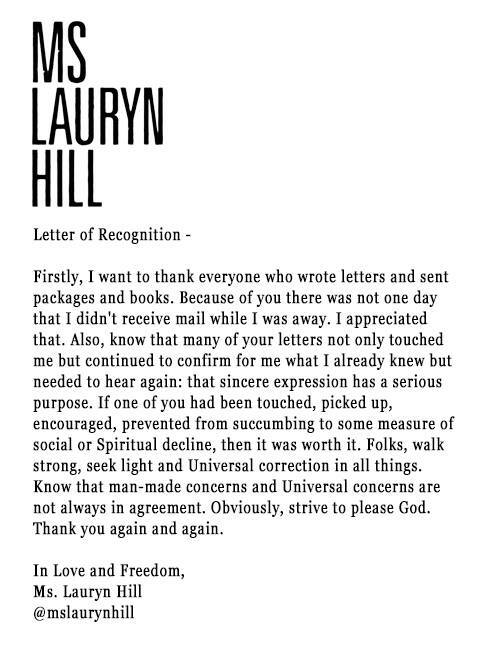 Below her Letter of Recognition, Lauryn lists countless upon countless names of people, some even twice, who have shown love and support during this turbulent time. Yes, not one individual was overlooked. Lauryn shows tremendous character, class and elegance in her effort to rage against the machine. Perhaps this will finally silence the critics. Below, I have copied a list of name Lauryn’s mentioned.